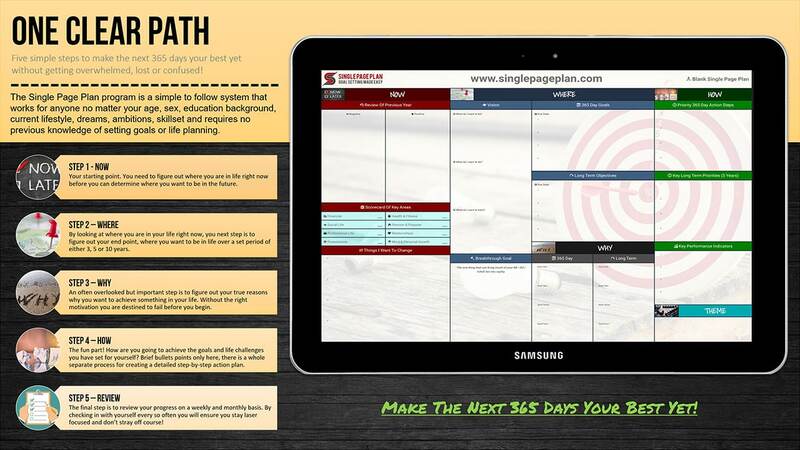 "Create The Life You Want To Live With The Single Page Plan System"
Use the Single Page Plan template and video training to quickly create your life goals and then follow a proven action planning process to achieve them over the next 365 days without going off course or getting confused! Setting goals is the first step in the life changing process. You need to figure out where you are now, where you want to be and why you want to achieve each goal. You need to start with your BIG dream. The Single Page Plan concentrates on setting goals for your life and working out the steps of how to achieve them. It will help you to create your action plan, a key tool if you are going to successfully change your life. Setting any goal is a pointless exercise unless you have a concrete action plan giving you an exact step-by-step process showing you how you're going to achieve them! 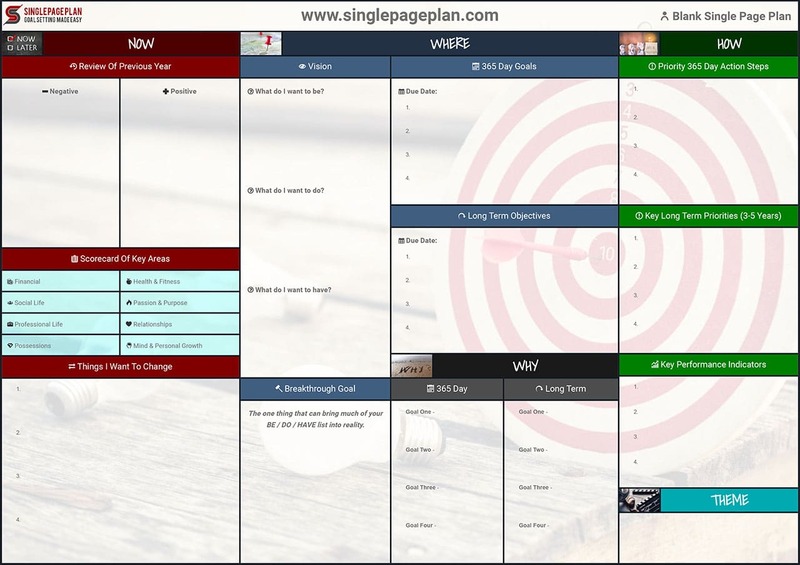 Is The Single Page Plan System For You? Whether you're somebody, missing your spark and direction in life, feeling stuck or confused about your future, wanting to do more, be more, achieve more, seeking clarity about where your life is heading, unclear about what is important to you, desperate to accomplish those goals that have long seemed out of reach, or looking for a life plan to transform your life, it’s time to get specific with your goals and plans. The clearer these are, the better! You’ve achieved a lot so far, but you need help getting to the next level. You’re too close to your problems to see the next steps, and need to find clarity to guide you to a more productive path. We all have battle scars, but some of us have trouble letting go of past experiences that limit and prevent us from moving forward in life and achieving our goals. You find that you’ve stopped progressing and are merely existing. You know life should be more than this. Maybe you have a goal or two, like starting a business and purchasing that sports car, but you lack a clear vision that will help you make them happen. You know what you want, but not how to achieve it. Formulating a clear vision isn’t your issue but creating an actionable plan which will allow you to work on your goals and keep you laser focused and on target to achieving your clear vision is. You’re still searching for your career path yet heading to mid life. Feeling unfulfilled at work or in your relationship? Just unsure about what you wish you were doing, even though you know it’s not what you’re doing right now? If you’re about to change jobs, move to a new city or get out of a relationship, it’s a great time to create a life plan. No matter the reason for wanting to make changes in your life at present, let the Single Page Plan be your Sat Nav to the life of your Dreams! Change your Life with the Single Page Plan system! We're here to support you in changing your life, starting right now and achieving amazing goals in the next 365 days and beyond! Achieving any goal you set out for yourself is a truly challanging journey. You just have to look at the failure rate of New Year Resolutions to know there is more to achieving a goal than just writing it down on a piece of paper and then leaving things to chance. 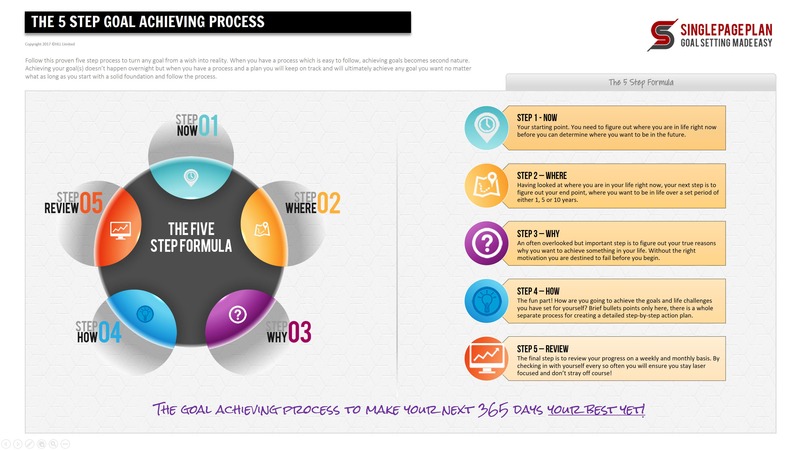 The Single Page Plan has been built around a simple 5 step goal setting formula to ensure you can create an effective goal setting strategy which when followed on a daily basis will ensure you are working towards your goals every single day. It's not a quick fix solution. Rome wasn't built in a day and you won't be able to achieve your goals overnight. It takes time and dedication but with the right system, support and determination you can achieve them yet the minute you start your life will begin to change ... for the better! Join hundreds of like minded people today and grab your template and training and we will walk you through the Single Page Plan template and the powerful 5 step goal achieving process. Plan for the life you want to live tomorrow, today! Creating your single page plan is going to get you to answer some challenging questions about your life as it is right now and your expectations and goals for the future. You have to commit the time and effort to go through this entire process from beginning to end. If you do take the time to sit down and really think about what you want out of your next 365 days you are going to be able to put together your own single page plan that at long last will lead to the unprecedented success you’ve probably wanted for more years than you care to remember. We want the single page plan to change millions of lives, including yours! With your completed single page plan template in hand you will have three vital pieces of information. 1. An understanding of where you are now. 2. A crystal clear vision of where you want your future to go. 3. A roadmap of how to get from where you are now to where you want to be. By devoting a few hours of your life now you will multiply the results you're getting in your life tenfold in the future. Are you willing to do it? Would you do it? Would it be worth it? Follow this system and you too will have the formula to achieve your own great dreams, desires and outrageously exciting goals. It starts by taking a few of hours to complete your single page plan. Are you willing to invest a few hours in order to set yourself up for a year of success? We have not yet found anyone who can't write a really succinct, great blueprint for their future using the single page plan. What we have seen is those who try and go back over it a couple of times will ultimately end up with it nigh on perfect. © HLL LIMITED 2018 - All Rights Reserved.